CHRR: As December 6th of this year is approaching, it marks the 3rd year that Majid Tavakoli, student activist at Amir Kabir University is behind bars serving his 8.5-year prison sentence. Judicial authorities refused to grant furlough despite the initial agreement to a 700 million-toman bail in September of this year. Daneshjoonews has conducted an interview with Majid Tavakoli’s mother regarding this issue. Mrs. Tavakoli continued, “If I could crawl all the way to see Majid I would do it. But what am I to do when I am sick. Who can answer me? Who can hear my roars and follow up for me? Who will hear my voice?” There were times during the interview that Majid’s mother was so choked up she could not talk. She said she is not upset about Majid’s imprisonment and she is very proud of him. “This is a mother’s heartache, a mother’s grief and suffering. I don’t know what to do. Who can I ask to come to my rescue? Does Majid who is behind bars serving his sentence ever get his right to make a call? Does he ever have a right to furlough? Does he have cabin visitations? His father is sick. His mother is sick. This is the torment I carry in my heart. Mrs. Tavakoli asks that since they have refused to grant Majid furlough on bail as they had promised, that they at least allow him to make phone calls to his family on visitation days. Following is the full interview conducted by Daneshjoonews with Majid’s mother. December 6th of this year will mark the 3rd year that Majid is in prison without his right to any furlough. Mrs. Tavakoli, please tell us briefly about how Majid is doing and if you have ever had the opportunity for visitation. During the past 3 years Majid’s father and I have had no visitation because we are both very sick. His father is sick. I am sick. We have had no visitation. They took away his phone rights since February 2011. I have no news of him. His brother visits him about every 3 months. We hear they blocked Majid from receiving his warm clothes. They told us to bring warm clothes and we did that but they refused to accept the clothes. We sent his warm clothes from Shiraz to Rajai Shahr prison and they would not take them. We were extremely unnerved and upset. They tell us we must take warm clothes for him and when we do they refuse to receive the delivery. What is a prisoner to do over there, how is he supposed to get warm clothes? He will get sick. Who will take care of him? Considering the prison conditions are not good and cold weather is fast approaching, in your opinion why did they block Majid from receiving warm clothes? They said they do not accept warm clothes that have zippers and are open, and will not accept his clothes. That is the extent of what they said and we really cannot figure out what the reasoning was. In September of this year judicial authorities requested 600 million tomans in bail money to grant a few days furlough, but they later retracted. Why did they change their minds and did you take any action in response? We provided the bail in September when they said Majid would be released on furlough. But then they didn’t grant him prison leave. We have no idea why and they never said anything about it to us. When we attempted to get information several times by contacting the prosecutor’s office, they would not respond to our inquiries. Do you think this is related to Majid being awarded the 2013 Student Peace Prize? I don’t know anything about this. I called them several times and they refused to give me any explanation. All they said was that they will follow up and that was all. Mrs. Tavakoli what do you think could be the possible reason that there is constant opposition to Majid’s furlough so that after 3 years he has not had a single day of release? I have no idea whatsoever what the reason is. Not once in the past 3 years have they shared with us why he has not been granted cabin visitation, any furlough, or the right to a phone call. Doesn’t every prisoner have the legal right to visitation, to call his family? Yet Majid is deprived of even these rights that are available to all the prisoners. They deprive only Majid from everything so that even his own warm clothes are withheld. I really don’t understand. I am sorry for their behavior I don’t know what to say. I am very sorry that a prisoner is deprived of his right to make a phone call, have visitations or furlough. I n god’s name I don’t know. We are a sick mother and a sick father. I am not physically capable of travelling for visitation. I do not ask them for much, just to at least on visitation days allow me to speak to Majid on the phone so I can visit him from afar. What difference does it make to them if I talk to him during visitation in prison or by a phone call since I am too sick to travel? If I could crawl all the way to see Majid I would do it. But what am I to do when I am sick. Who can answer me? Who can hear my cries and follow up for me? Who will hear my voice? I don’t know what to do; I swear I just don’t know what to do. Majid has gone through 3 years of prison without one day off on furlough; he has not had the right to a phone call since February 2011. Not one call to this sick mother who waits in desperation, counting the moments day and night, longing to hear the voice of her son. I have forgotten what he looks like. I swear I have forgotten. God I don’t know what I can do. I just don’t know who to share my suffering with. This mother’s heartbreak, mother’s agony; I don’t know what to do. Who can I ask to come to my rescue? Does Majid who is behind bars serving his sentence ever get his right to make a call? Does he ever have a right to furlough? Does he have cabin visitations? His father is sick. His mother is sick. This is the torment I carry in my heart. I am not upset that Majid is in prison, I am proud of my son. But they deprive him of his rights as a prisoner. He has the legal right to call his family, to have cabin visitations, to receive furlough. But I don’t know why they will not allow it. I feel sorry for those in charge. In consideration of your illness and the illness of Majid’s father preventing you from traveling to visit him at Rajai Shahr prison, has anyone in charge responded to your request to at least be granted the right to a phone call during visitation days? When I call the offices of the judicial authorities they refuse to answer and say the orders come from above and they cannot do anything about it. That is as far as they will go and they will not share anything else. I call the prosecutors office but I have never succeeded in talking to him. When I try to leave a number for him to call they say I am not allowed to do so and I have to get an appointment. We have written letters. Their response was that we had to come up with the bail money, which we did, and again they refused to acknowledge us and ignored our request for furlough. It is close to 3 years since Majid was detained on Student’s Day while he was making a speech at Amir Kabir University. During this time so much has been shared about Majid’s courage and efforts for the people, for political and student activists. Majid is referred to as the “honor of the student movement.” He has been honored and celebrated in various events. What do you have to say to those who have stayed committed to remembering Majid for the past 3 years? I am thankful to all of them. Majid is not mine. He belongs to the people of Iran, to those who work tirelessly and keep us in their thoughts. God bless them all. I thank all those who call and visit me while I am sick. I am so appreciative and I am so thankful for all their efforts. We are proud of these people and we are alive because of their voices. Mrs. Tavakoli I thank you for talking to Daneshjoonews. We hope that we will soon be witness to Majid’s freedom. Please share your closing remarks. I don’t have much more to say. This is a mother’s heart-to-heart, a mother who has not seen her child for 3 years. For 3 years I wait in anticipation and longing. For 2 years my son is banned from using the telephone. I posted a bail expecting to finally see Majid and they blocked his temporary release without giving any reason. My message to the authorities is to listen to a mother’s cries. My only demand is that since they prohibited his furlough, they grant Majid his telephone rights or at least that they allow him to call on visitation days. I will pay for the phone calls so that on days when other prisoners have visitors, I can at least talk to my son on the phone. I ask that those in charge pay attention to the yearning of a mother who has not laid eyes on her child and waits in anticipation. This mother is not asking for much, just to speak to her son from afar on visitation days. یک دولت نالایق جایی جز زندان برای نگهداری افراد لایق کشورش نداره. For now we have our hearts broken as a result of the actions of anti-intellectuals and anti-monarchists from 1979-open. 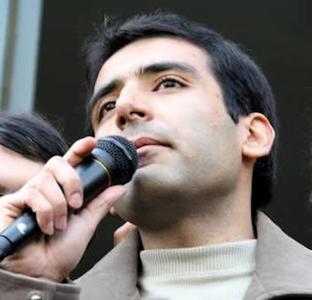 Majid Tavakoli will someday be elected president in Iran. Deservingly in my book - he is a genius who passed the courage test!! Regime change is the only way to put an end to 34 years of barbarity at the hands of the Messianic Islamist Rapists, “reformers” and all.